Crypto-loan is an opportunity to receive the necessary amount of money guaranteed by cryptocurrency today. Our on-line service offers its customers to use the new service “Crypto-loan”, which will allow you to instantly receive money backed by your cryptocurrency. 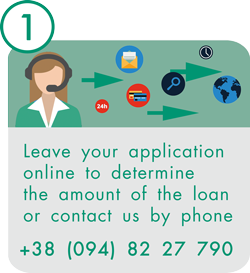 A loan is available for customers from 10 000 UAH to 250 000 UAH on a card of any bank of Ukraine. Through payment systems AdvCash, Payeer – от 500 USD/EUR до 10 000 USD/EUR, от 30 000 RUB до 600 0000 RUB, Perfect Money от 500 USD/EUR до 10 000 USD/EUR. You can choose your terms: from 10 days to full repayment. You have a possibility to renew the loan agreement. Loan in any currency which equals to 10 000 USD. You can take several loans at once. No hidden fees, transparent calculation system. Fixed interest rate for loan use. 100% approval for all Customers. You can close the contract ahead of time by paying only % for the actual number of days of using the loan. To apply for a loan, you just need to write us on chat. In the absence of depositing % for the use of the loan, the payment is made from the amount of the value of the secured asset. In case of automatic sale of loan currency, your contract is considered closed. Loans are issued on security of crypto assets at an interest rate of 0.49%/day. When a loan is repaid, the client receives a pledge in full. 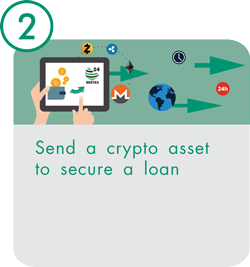 A loan secured by a liquid cryptocurrency is a profitable deal with the ability to personally manage cash, bypassing the traditional investment. The program “Crypto-loan” is specially designed for our customers, who urgently need fiat money, but they don’t want to say goodbye to their cryptocurrency. 3. Instantly receive money in just 30 minutes, even with a bad credit history. Crediting of funds to the Privat Bank card is made within 30 minutes. Crediting funds to cards of other banks of Ukraine (excluding bank commission) can take up to 3 banking days.